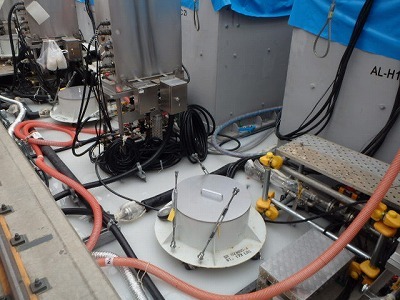 One of the most dangerous places at Fukushima Daiichi may undergo work to reduce the ongoing risk. Soon after the disaster workers at the plant discovered that their dosimeters would high radiation alarm then be unable to give a reading when they approached the unit 1-2 shared vent tower. This was an indication that radiation levels near the tower were so high that their dosimeters were unable to accurately read the level. This location has also been suspect in the death of a worker back in 2011. One of the two units connected to this vent tower ejected considerable amounts of radioactive materials via the tower during the initial disaster. The area has been declared off limits with shielding walls installed. Closer inspection with cameras and drones showed that the tower had suffered structural damage and was at risk of collapse or further damage. 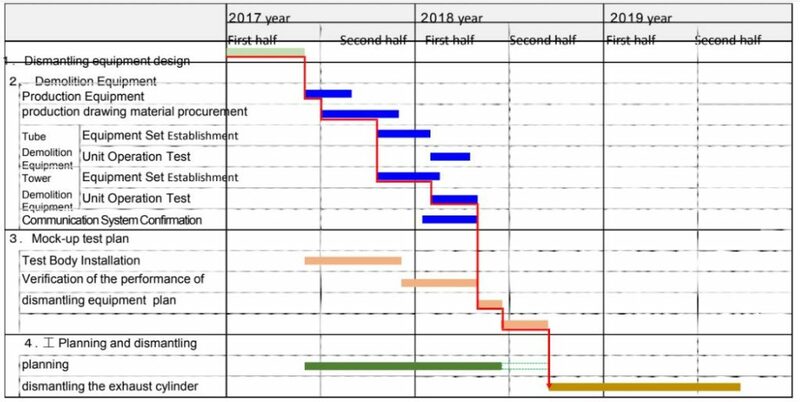 Since then TEPCO and the research agencies tasked with disaster clean up at the site have been working on a plan to dismantle the tower. The current plan includes a complex series of machines and equipment designed specifically for this task. The work would remove the upper portions of the vent tower then install a cap on the top of the remaining pipe. This is assumed to be used to prevent further release of radioactive materials or inflow of rainwater into the highly radioactive area. 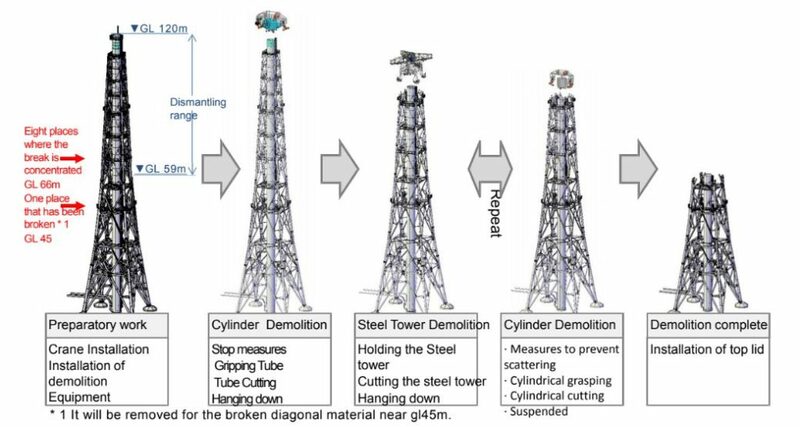 The graphic below shows the steps towards cutting down the tower in sections. A series of grabbing implements would be used suspended from a crane to attach to the tower section. Then cutting arms would cut the section from the tower. The rig would then lift the section off of the tower to the ground. The only attempt to prevent radioactive particles from flying away or otherwise redistributing during this work is the use of dust suppressants. Dust inhibitors would be sprayed on the area while removal work is progressing. This technique has been widely used at the site but is not 100% effective in suppressing radioactive dusts. TEPCO has not clearly documented what types of materials compose the contamination of the tower. If microparticles of fused radioactive materials from the reactors are included in this contamination, those pose a much higher risk than other types of contamination. 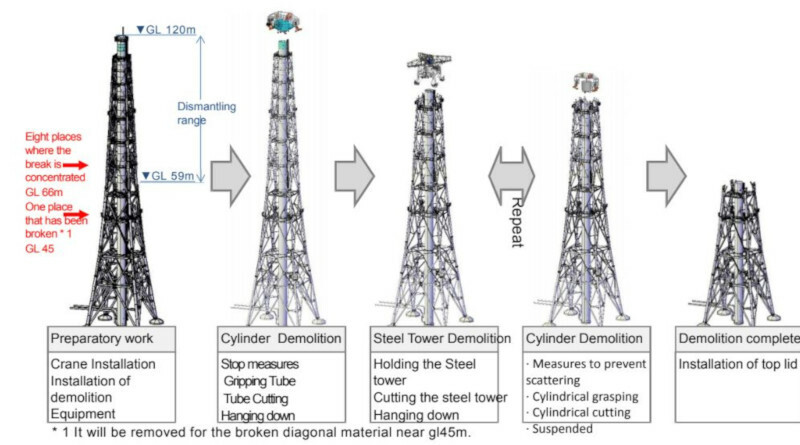 Images below show some of the grappling equipment that would be used to hold the vent tower during the demolition work. 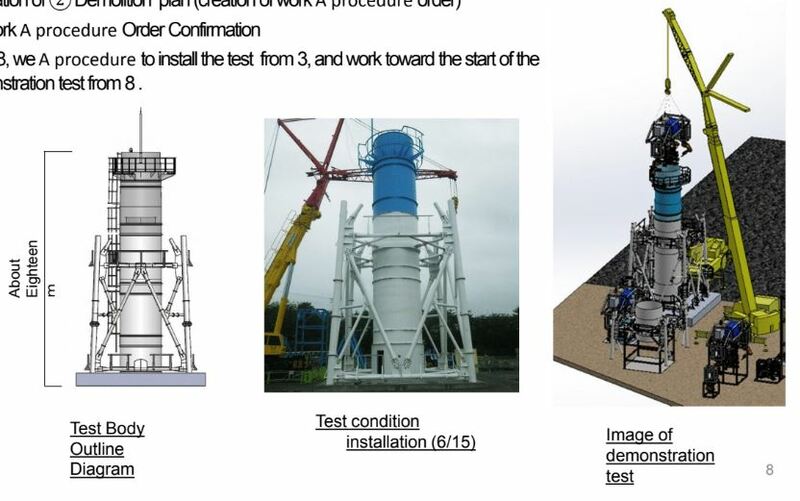 A mock up of the tower structure has been created for workers to practice using the equipment. 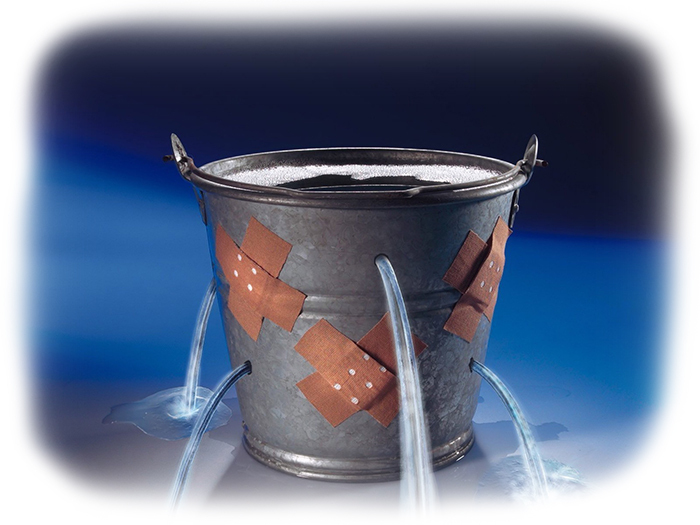 This is intended to help workers find problems and solve them before attempting this actual work. This has become a common process for work at the disaster site to improve the success rate and lower the chance of unnecessarily exposing workers. Once a section of the vent tower is removed it will be temporarily placed in a location near unit 2. It will later be moved to a demolition location near the sea front. This is likely where it would be cut down into sections small enough to store as radioactive waste. TEPCO provided no details how this work would be done in such an open location without causing the distribution of radioactive dust or exposure to workers. A schedule for the work is outlined below. The actual demolition work is scheduled for fall of 2018 and could take a year to complete. This information comes from a June TEPCO report. A machine translated version of that report can be found here.